Chris Yearout is a passionate advocate who attacks his clients’ problems with creativity and efficiency. Chris represents clients in a broad range of practice areas, including product liability, healthcare, commercial disputes and toxic torts. Whether it’s representing Alabama doctors accused of medical malpractice or multinational corporations facing product liability actions in forums across the country, he aggressively, creatively and efficiently represents his clients in every facet of litigation. Chris takes pride in fighting tirelessly for his clients and providing solutions to their most challenging legal problems. An active member of the legal community, Chris is a member of the Defense Research Institute (DRI) and has presented at DRI’s Product Liability Conference. Since 2014, he has been recognized by Super Lawyers as a “Rising Star” for his product liability and medical malpractice defense work. B-Metro magazine also named him as a “Rising Star of the Bar” in 2013. 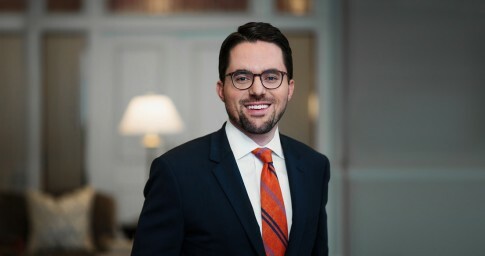 Chris graduated from Auburn University with a degree in economics before attending the Cumberland School of Law at Samford University, where he served on the Editorial Board of the Cumberland Law Review and graduated with honors. He is a Birmingham native and is proud to call the Magic City home. Outside the office, Chris is a member of the Cathedral Church of the Advent and is an avid Auburn fan. Most importantly, he is a proud husband and the co-founder of two beautiful children who thankfully look like their mother.